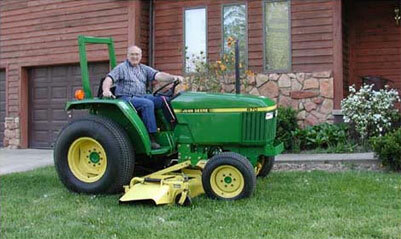 This John Deere model 60 was purchased new by Elizabeth's father in 1954 and it has remained in the family ever since. We recently acquired it from her brother in New York. In the photo above, Elizabeth can be seen adding power steering fluid in an attempt to solve a steering problem. We decided fixing it was beyond our level of expertise so we took it to the local John Deere dealership. The tractor has spent most of its life outside which has resulted in considerable rusting. We have managed to install all new gauges just so we could get it running with confidence. Hopefully we can give it a new coat of paint during 2007. Elizabeth has considered painting it pink to match the ladies JD hats. SN136698 built in 1958. We purchased it on 3 April 2010 in Gallipolis, Ohio. We found this Allis-Chalmers Model G at a yard sale in Ohio during May 2001. We gave it the name Pumpkin because of the rather obvious color. We displayed Pumpkin at the WV State Farm Museum annual Gas and Steam Engine Show in 2002. It is seen here parked by one of the log cabins. We have been presented two Exhibitor plaques by the West Virginia Antique Steam & Gas Engine Association, Inc. in 2002 and 2003 for showing Pumpkin. The rims should be painted silver for it to be a more accurate restoration. 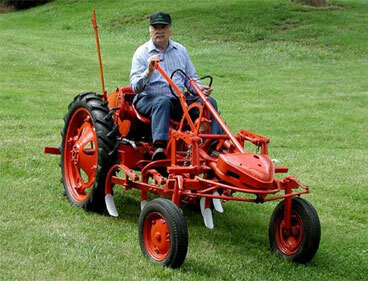 Any number of attachments like a plow, disc, sickle-bar mower, etc., were available for these small tractors. They were designed to replace a horse or mule and apparently did that very well. They certainly have outlived any mule born in the 1940s. This tractor was made sometime between 1949 and 1952. The G is most useful on farms of today as a cultivating tractor. The driver sits in the center of the tractor directly over the row being cultivated and has unlimited visibility. No excuse here for plowing up your tobacco or as they say in the south your "backer" plant. 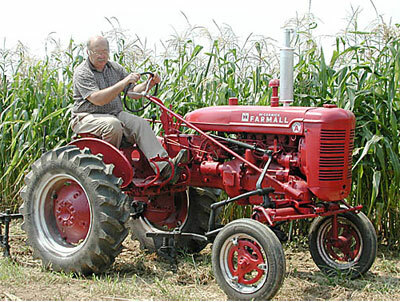 Jim is shown here on his Farmall Super A with cultivators. The tractor engine is to the left and the driver sits to the right above the row that is being cultivated. This arrangement makes this an ideal tractor for cultivating row crops. This style is a favorite of tobacco and truck patch farmers. The cultivators have never been removed since Jim has owned the tractor. 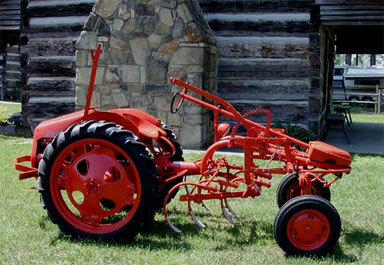 The tractor has been used to cultivate Jim's brother-in-law's garden and sugar cane at the West Virginia State Farm Museum. The tractor above is our lawn tractor. It is a John Deere 870 and has a 72-inch (6-foot) mower deck. It is great for mowing our one-acre lot. The tractor is also used to pull a 4-foot brush hog. (Actually, the brush hog spends more time in reverse so as not to scratch the tractor!) It is equipped with turf tires to prevent tire marks in the lawn. It is our only 4-wheel drive tractor and our only diesel tractor. We bought this Gravely walk-behind tractor when we were maintaining two building lots that we owned. It was perfect for mowing around all the trees. We have sold those lots so the Gravely doesn't see a lot of use now. While the lawn was very wet in the spring, we installed the dual wheels to keep from making ruts. The duals make it very difficult to control without the power assist. Our model has a steering handle that applies brake pressure on one wheel or the other and it can be controlled with one hand. We have a new tiller for it which we have never mounted. 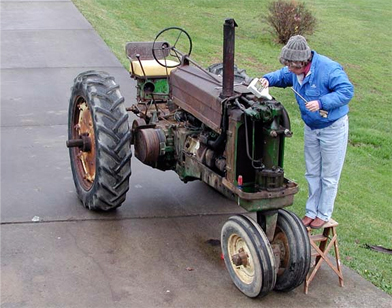 The dual wheels are removed most of the time and standard single-wheel tractor tires are mounted. This allows the wheels to be inside the mowed area which is about 30-inches wide Our unit has kill switches of each handle grip which have caused problems for us as they seem to not always make good contact. 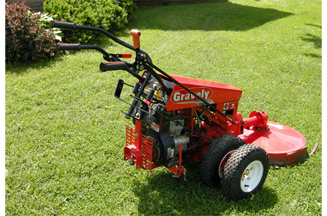 Gravely no longer manufactures this unit. A dealer told us they stopped making this model about 2000 but parts are still available. Our next-door neighbor has a Gravely riding lawn mower that he likes very much. We have a sulky for our Gravely and it works well for mowing level surfaces.